This headline will appear if you enter the website of the FBI, searching for information concerning white-collar crime. In the following paper it should be figured out, how the offenders should be punished, what role a prison sentence serves and if it is the best way to punish whitecollar criminals. 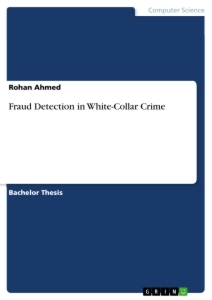 After defining white-collar crime and explaining the miscellaneous faces and cha- racteristics, the reader will be provided with some facts and figures about white- collar crime. Afterwards, different theories and forms of punishments will be pre- sented followed by an examination of prison sentences as the best way to punish white-collar offenders. This thesis should be applicable for most of the common western law systems. It is not based on the law of a specific country, but a presentation of international accepted principles and theories. Even though, the shown figures base on data of just one country because worldwide information where hardly available, the situation in the predominant number of western countries is comparable. Today, the topic is very up to date because of the recent economic crises. Regarding the mass of literature about white-collar crime it is really hard to find an agreed definition for the term. Depending on the goal of the topic, the definitions vary a lot.5 For example, the police do not define the term in a special way. They treat whitecollar criminals just like blue-collar criminals, who have committed a lot of usual crimes at once.6 In the field of auditing the different explanations have in common that white-collar criminals betray the economic participants trust.7 The social definition stresses the social position of the criminal. Summing it up, one can say that white-collar crime stands for well integrated, intelligent employers, who commit their crimes by exploit their trust position, step by step, with deliberate and accurate planning, without attracting attention. The faces of white-collar crime are very different and include from soft to hard crimes almost everything. The measurement of the heaviness depends on the committed delict by the person and his hierarchical position in the company. Of course, in the end the punishment depends on the caused damage. Soft crimes represent small, rather unoffending acts that do not really damage the company. These acts often happen but without attracting attention. The perpetrator can be almost everybody. Exemplary cases are surfing in the internet during work- ing time, overdrawing lunch break or using the company’s telephone for private purposes. As it is written in the headline, the following extract is about barely tolerable crimes committed by people with high criminal energy. These are offences like theft from the store, acts of sabotage, computer crime or document falsification. Measures that could be used in this case are access limits for some parts of the company, accidental controls of the employers, warnings, cautions or firing. Finally, the most important and spectacular faces, which serve for hard cases are people, who are able to lead a company to big debits, damage its reputation or at last getting bankrupt. These criminals plan their doings carefully and for a really long time. With the support of the company’s knowledge, they know how to turn economic gaps into their advantage and to profit from them. In these cases it is difficult to control the procedure and to prevent the crime. The mutual trust impedes the attention for friction, so the crime is recognized when it is too late. 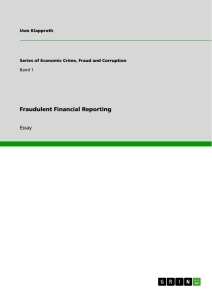 Most of the crimes arise in the financial sector. The character of the white-collar criminals can be described as fearless, adventurous and obsessed for tangible wishes.14 In other words, on the one hand they are less scared about the consequences of their acts and decisions. The thought about possi- ble punishments do not bother them, because they are much more adventurous then other people. On the other hand, these criminals are used to measure their wishes in money. The quantity of money is the only way they define their success and self- confidence. 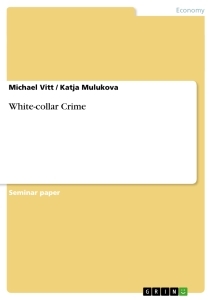 Especially today, white-collar crime is a serious and often underestimated harassment for many enterprises in our global business environment.15 Missing cognition in society is another problem: “Due to ignorance and disinterest it’s hard to find journalists reporting on the socially detrimental of white-collar crime.”16 In comparison with homicide, serious assault or terrorism, the public does not seem to be very scared by white-collar crime. It is more likely that people are fascinated by the offender than thinking about consequences for their personnel life. 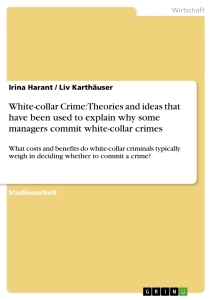 The following extract should provide an insight in which breadth white-collar crime takes place, what the perpetrated damages are and how white-collar criminals are being punished. Nevertheless, the number of committed white-collar crimes increased continuously over the last years. The peaks in figure 1 can be explained due to complex investigations continuing into the next year. The information value of the shown figures on page 5 is limited and cannot mirror reality accurate, because the statistic (PKS18,19 ), the figures are based on, does only contain registered cases and does not include cases, where the police was not directly involved (e.g. 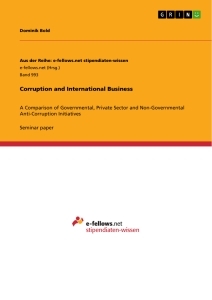 several investigations of tax authorities). 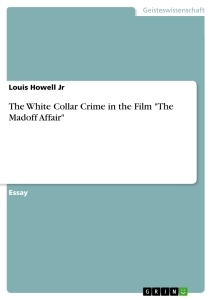 However, one can obtain a good insight in which breadth white-collar crime takes place. The number of committed offences recorded in the PKS21 and the share in the distribution of criminal acts do not reflect the full extend and relevance of white-collar crime. The significance does not become apparent until the distribution of criminal offences is compared with the caused damage. This damage can further be divided into material and immaterial damages. 2 Cp. Peemöller / Hofmann (2005) p. 17. 4 Cp. Voyame (1982), p. 24. 5 Cp. Mang (2004), p. 5. 8 Cp. Mang (2004), p. 121. 9 Cp. Ambrose (2002), p. 947 et seqq. 10 Cp. Fenichel (1985), p. 100 et seqq. 11 Cp. Müller (1990), p. 161. 12 Cp. Comer (1987), p. 70 et seqq. 13 Cp. Müller (1990), p. 153. 14 Cp. Smettan (1992), p. 23 et seqq. 15 Cp. Janke (2008), p. 5. 16 Berthel (2003), p. 22. 17 Cp. Berk (1983), p. 623. 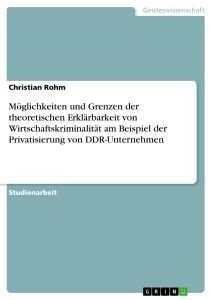 18 The ‚Polizeiliche Kriminalstatistik’ (abbr. PKS) is a crime statistic created by the Federal Criminal Police Office of Germany (Bundeskriminalamt, abbr. BKA). 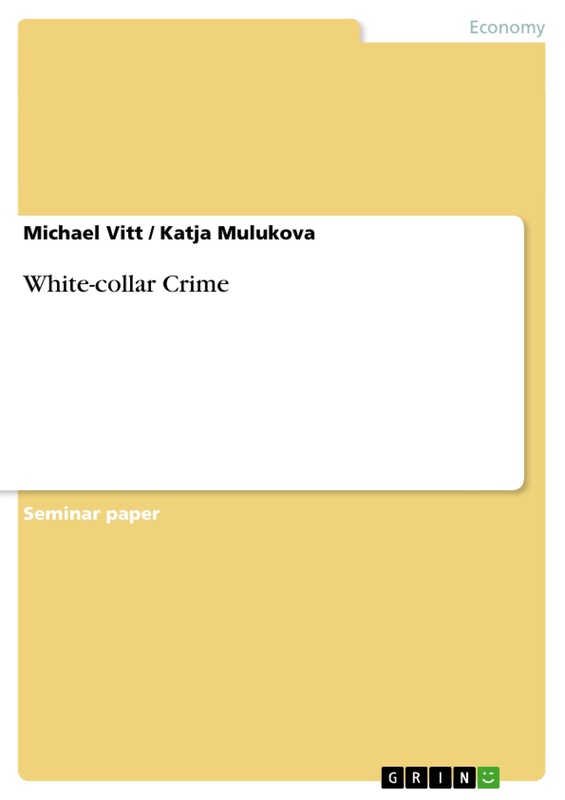 19 In the PKS white-collar crime consists of insolvency related crimes, financial fraud, embezzlement, violation of competition law and employment related white-collar crimes. 20 Cp. Berthel (2003), p. 23. 21 See supra note 18. 22 Sutherland (1983), p. 9. 23 Cp. 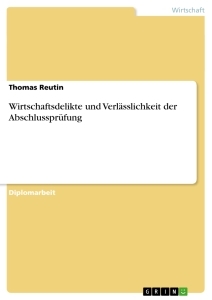 BKA (2010a), p. 69. 24 Cp. BKA (2010b), p. 108. 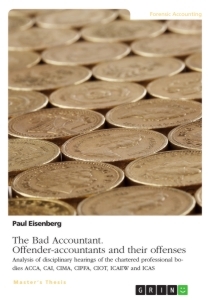 How should white-collar criminals be punished? In the past, white-collar criminals have not been sentenced to prison. But in recent years, more and more white-collar criminals have received lengthy prison sentences. What role does a prison sentence serve and is it the best way to punish white-collar criminals?